It takes more than the mighty bat of Ortiz to keep the good vibes flowing at Fenway Park. 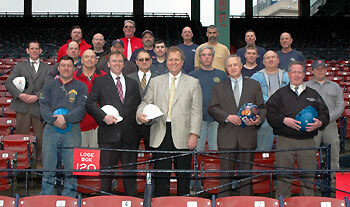 Representatives of the Plumbing Heating Cooling Contractors of Greater Boston and Plumbers Local 12, both clients of The ART of Communications, gathered in Fenway's grandstands to celebrate the completion of a renovation project. Plumbers have long played an important role in the development and preservation of Boston's beloved baseball cathedral. The photograph below shows the plumbing crew of the William McKenna Company during the complete renovation of Fenway Park in 1934. The plumbers and contractors represented by the organizations are on the job at nearly every major construction project in eastern Massachusetts, including the new Boston Garden and Gillette Stadium. Raise a beer to the plumbers the next time you cheer your favorite team. At The ART of Communications, an independent writing, advertising, and communications agency, the focus is on you: your goals, your messages, your audiences, your budget, and your success. The AOC mission is to develop and deliver fresh, innovative solutions that will target your markets with the most creative programs--on time and with reasonable rates. 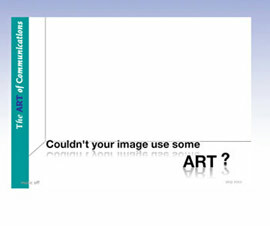 Play The ART of Communications intro.